Blondie and Brownie: Legalize Cachaça! Friday was a brutally hot day and I was wandering around Manhattan doing some last minute Father's Day errands. By the time I got to Union Square it was the real heat of the day. Then I noticed the bright green truck. Was it a mirage? Were they selling Caipirinhas? What's up with this "Legalize Cachaça" movement? 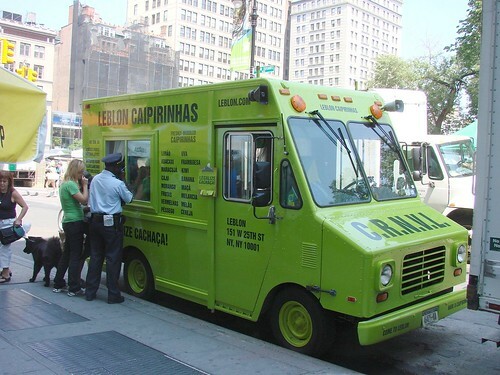 Alas the truck doesn't vend Caipirinhas, but they were offering samples of Caipirinha sorbet which was not too sweet and super refreshing on a wicked hot day. 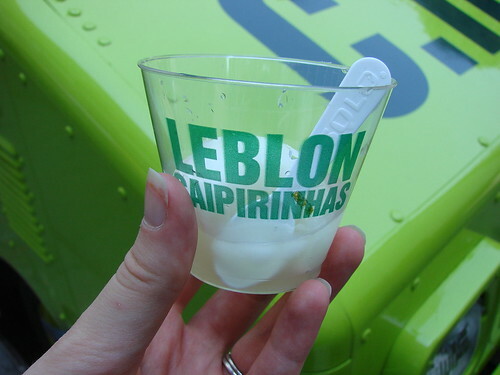 The Leblon Caipirinha truck will be in town all summer promoting Cachaça and working on their mission to get the liquor officially recognized as "a distinctive type of Spirit and unique only to its country of origin, Brazil." cachaca isn't legal over there? it's one of my favourite spirits! and caipirinha sorbet sounds fit! I saw them at the Gourmet Latino Festival. Cachaca is legal here but there's a fight over labeling and whether or not they have to call it Brazilian rum which obviously it's not. Happy to see there still rolling!